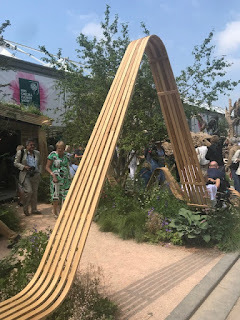 This is my third and final post from this year's RHS Chelsea Flower Show. This time I am going to focus on what were the winners for me. The gardens, the products and the moments that made this year all a bit special. This is my favourite show garden from this year: The Trailfinders South African Wine Estate designed by Johnathan Snow. The garden won a Silver Gilt Medal, which surprised me as I thought it beautifully executed. Funnily enough though, the RHS do not award medals on what my opinions are (their loss). The range of planting shouted South Africa to me, and it was beautifully done. The use of the burned plants in particular worked well. The use of colour and natural rocks was outstanding. What was interesting about this garden is that it took me a couple of standing and staring at it moments for me to really appreciate all of it. The first time I looked at it I thought it was good, I thought it was nice; but it was when I came back after looking at the other gardens and when I was discussing it with my daughter, who was my company for the day when I went on Wednesday, that it started to really work its charms on me. Sometimes I find that when I am having to articulate thoughts out loud they become more clear and this certainly was true of this garden. This steam bent wood bench from Tom Raffield stopped me in my tracks. It is without doubt a thing of beauty. It organically wound itself around the exhibit. and just had to be followed to see it disappear into the foliage. I stood in front of these planters for too long and the coat loop (find it on his website) drew me back for a second viewing and I only just managed not to buy one.........yet........... I have a hallway short of a coat-loop. 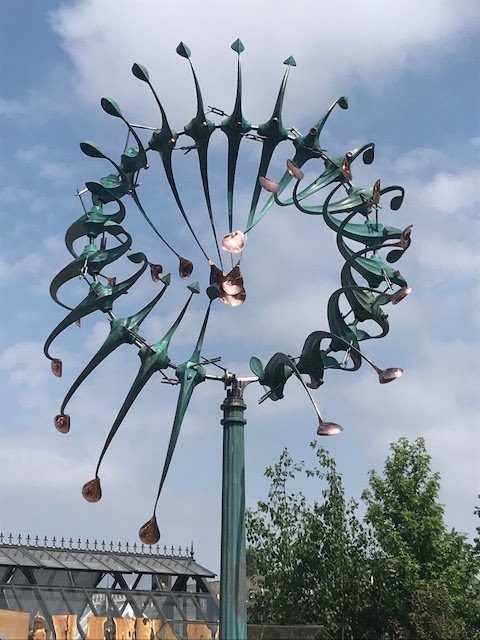 I spent a lot of the show looking at spinners, this is by far my favourite, it moved with an elegance that was mesmerising. It is, however way out of my budget and also would not look its best in my garden. But know that if I could I would. I also spent quite a lot of time looking at words carved into slate. I love the simplicity of it and it is an element I would like to add to my garden at some point when the right words come to me. I am not intending on buying a large metal-work horse, but if I was then this would be the one. I loved it, it was made with skill and it has character. and things of beauty were admired. As regular readers know, there is a high chance that I will be moving house this year, the chance is getting to be more definite but there is a still a long way to go. This heavily influenced how I viewed Chelsea this year. 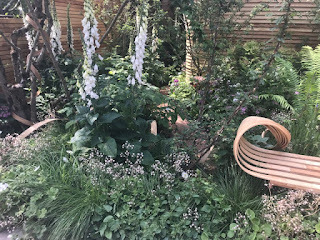 I looked at gardens and displays with thoughts of 'would that work with the new garden', and 'oh I could actually do that this time' running through my head. Wandering around, talking to my daughter about ideas, pointing out things that might work with what she wants to do in her own garden and generally talking through the exhibits and gardens was just a delight. It focussed my thinking and broadened my view. I finished my trip to Chelsea exhausted but totally happy. I am, as ever, looking forward to next year already as this year's Chelsea is the best I have been to in recent years. 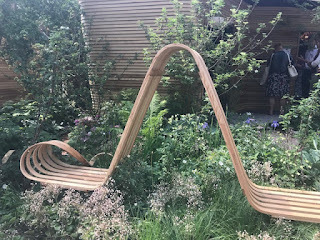 Just read your Three Parts of the Chelsea Flower show. Must be great to visit this best flower show in the world. This year I have not seen much of it here on TV, but I still hope to go there one of the next years. Ive seen the South African garden on a few posts and I really liked it from the start. 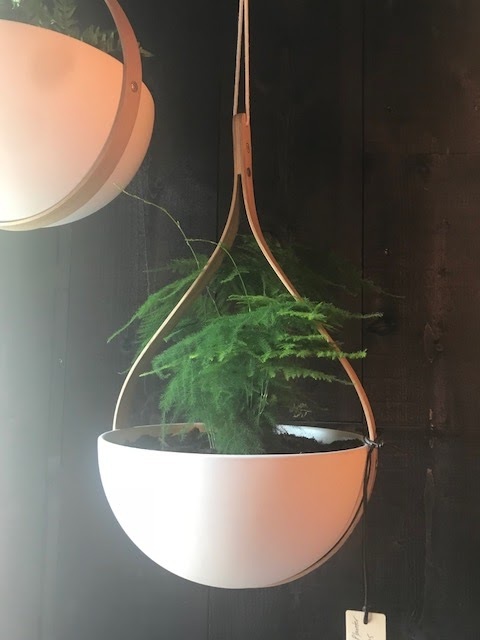 I thought the plants in it had a lot of impact. I’ve read your other posts about the show and really enjoyed them.